As a child every time I went to Disneyland, one of my favorite traditions was to stop off at the brightly lit, old fashioned penny arcade. Armed with a pocket full of pennies, I would use them all up at the row of Mutoscopes. Invented around the turn of the century, the Mutoscope was one of the first devices to allow people to watch movies or moving pictures. The coin operated device operates with a system of cards that are shown, where by the viewer looks through the lens and sees the cards moving almost like a flip book. Some of the reels shown depicted comedic performances or heart-felt almost borderline cheesy dramas. 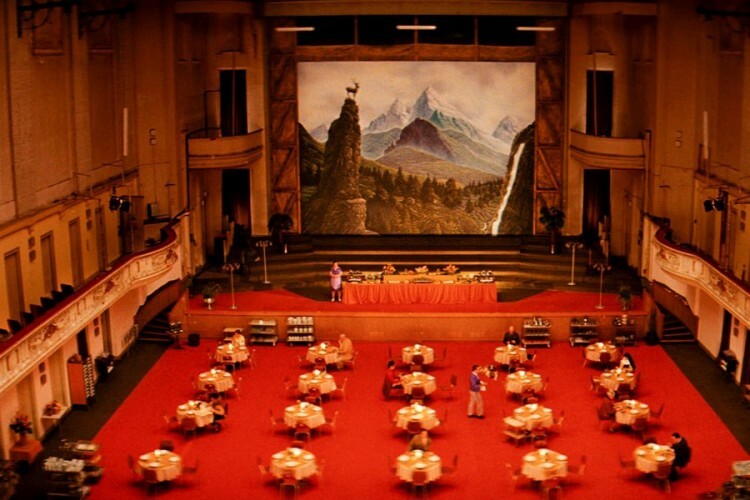 When I saw Wes Anderson’s most recent film, The Grand Budapest Hotel, if one was to capture and pause a scene in the movie it would be reminiscent of those silent era Vaudevillian reels. Anderson also reminds me of Alfred Hitchcock, who was obsessed and almost fetishized women, every detail of them; their icy blonde hair coupled with beautiful skin was meticulously perfect and his ability to kill or psychologically damage them in films was almost creepy. Some may criticize him, but he gave us infamous female characters and films that we will never forget. 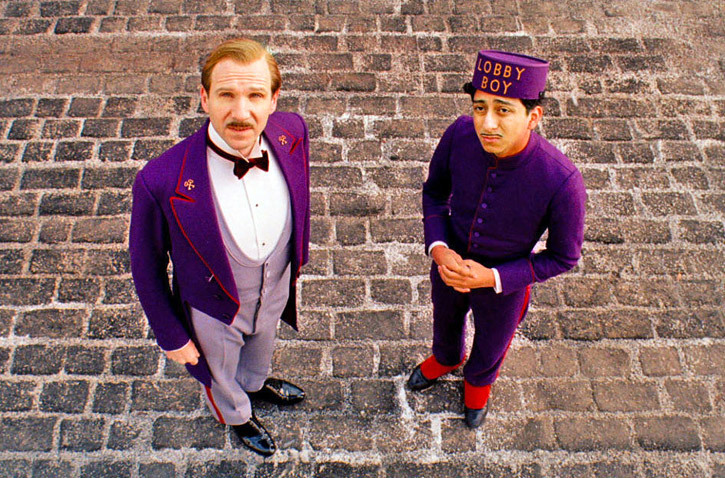 The Grand Budapest Hotel once again gives us Anderson’s thematic traditions that are well known and undeniably his, a rich color palette, symmetry like no other and a whimsical child-like quality to the entire film. Call him obsessive, egomaniacal, idiosyncratic, similar to Hitchcock, or whatever you would like, but he is a genius and his work will remain indelibly strong in cinematic history. 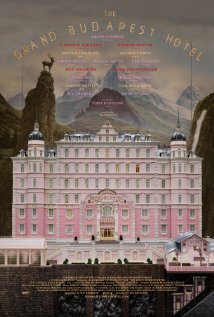 The film is about the Grand Budapest hotel, a once luxurious retreat, set in the Republic of Zubrowka, a European alpine state, which is fictional and resembles the German Alps. In its heyday, it was a bustling hotel, filled with extravagant guests and the hotel itself has to be navigated in intricate ways, from going up one elevator to a pair of stairs, through the kitchen and leading back to the outside and getting on what resembles a snow lift, then one gets to a certain room. The exasperating nature of almost going through a maze is felt and the grandeur of the hotel is made certain. A young writer (Jude Law) enters the hotel in its present time period and it just feels like a really big open space that is disheveled and almost sad in comparison to what it used to be. This is where Anderson gives us the big, aerial views and wide shots he is known for, everything in the frame is meticulously placed in an order that makes me believe he has OCD. The hotel staff, such as the concierge M. Jean (Jason Shwartzman) seems to not really care for the place or view it as important; in fact he doesn’t even have the energy to straighten up the paintings on the wall. When the writer is invited to have dinner with the owner, Zero Moustafa (F. Murray Abraham) he begins to find out the back story of the hotel and find out what happened to it over all these years and how Zero came to be the owner. This is when the story now shifts and we come to find out that it really is about the relationship between M. Gustave (Ralph Fiennes) and the young Zero (Tony Revolori), and how Gustave came to entitle him with the hotel and the particularly the love that he lost along the way. War is on the heels of the world, but Gustave cannot be bothered by that fact, his utmost concern is retaining the beauty and order of the hotel, along with his own good looks and particularly remaining always smelling of the most expensive cologne available. He is a gentleman and one who favors the traditions of the past, this character particularly reminded me of the actors of the silent era. Debonair, well put together, and always gracious. Zero becomes his lobby boy and is the most faithful one anyone could ask for, considering he has no one else, so he devotes his life to the tutelage of Gustave. Throughout the film, we see him follow, even replicate the movement’s of Gustave, this only further adds to the effect of symmetry and composure. The trouble arises with the death of one of Gustave’s ladies, Madame D. (Tilda Swinton), as he loves rich older women and they love him back, but this one in particular was filthy rich and dies suddenly and mysteriously a few weeks after leaving his hotel. Gustave takes Zero with him to attend her funeral and the reading of her will. 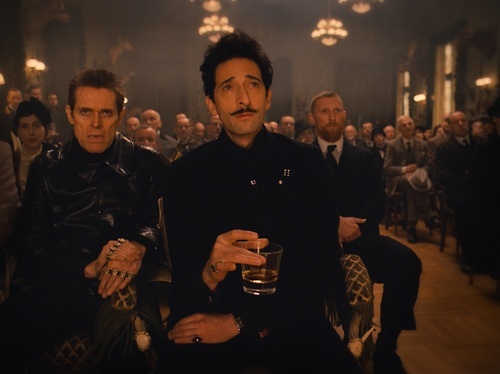 In attendance are her daughters and her ruthless son, Dmitri (Adrian Brody). When Deputy Kovacs (Jeff Goldblum) reads the will, we come to find out that she left him a painting, Boy with Apple by Johannes Van Hoytl The Younger. Now this drives the family insane and he and Zero figure out a way to escape and take it out and put it back in their safe. While they are figuring out how to keep the painting safe and retain their legal authority to it, her family, specifically her son Dmitri are figuring out how to get it back. The hijinks that ensue take the viewer through a whirlwind, nostalgic look back into time coupled with slapstick-like humor, very Buster Keaton-esque, all which make for a fun, good time. Each scene in this movie resembles a diorama, with every person and thing meticulously ordered, each outfit precisely colored and every movement choreographed with symmetry and juxtaposition. Anderson has been criticized for overtly favoring theme over substance, but in this film I believe he is able to capture both without leaving the other devoid. The narrative not only is comprised of the story of Gustave and Zero, but also the romance of Zero and Agatha (Saoirse Ronan). Their relationship once again brings us back to the underlying theme of love and the ability of the characters to make their own improvised families. The two are tender and sweet together and they prove that everyone deserves to be loved. This movie retains the qualities of an era gone by, like those from silent films with madcap adventures in full tow, think motorcycle chase scenes with silly over-dramatized faces and a sense of melancholy that oozes from so many characters. 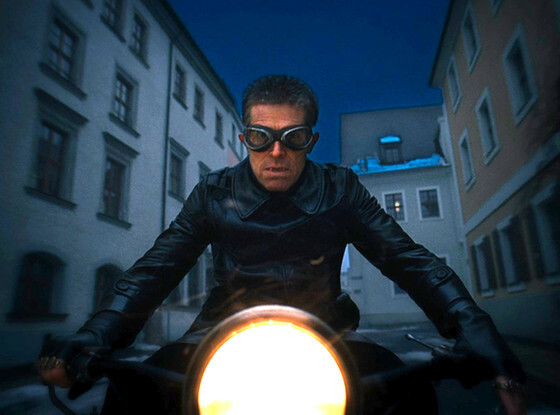 Specifically the scenes with Jopling (Willem Dafoe), Dmitri’s underling, we see the acting style of the silent era, for example when he is on the motorcycle and the ski lift, his face alone speaks volumes and conveys emotion. With all the components put together Anderson has created a beautiful, bittersweet film, filled with purples and pinks to delight the senses and an unimaginable array of antics to keep the humor up and a sense of love reigning over all. Fiennes takes the cake for his performance, one of my favorites from him and will remain as one of Anderson’s best casting choices. Of course his usual cast of actors are in the film, Bill Murray, Owen Wilson, Edward Norton and the like, but Fiennes exceeds with his portrayal of Gustave. At times we think he is vain and an egotist, but he is also compassionate and tender and both sides meld to form one distinct and almost regal character. 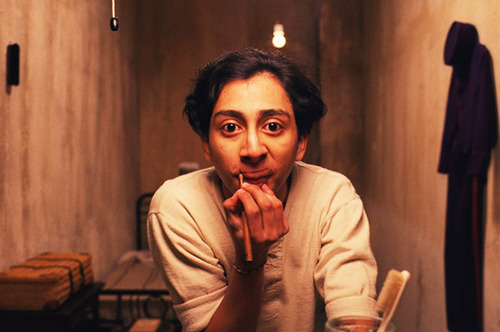 Newbie, Tony Revolori did a fantastic job as well, having to perform against such dignified actors he held his own and was captivating on screen. I look forward to seeing him in more movies and hope that this film can serve as his calling card for great work. I also hope that Ronan will be part of Anderson’s future ensembles, in a sea of crappy; over hyped young actresses she is quietly perfect and magnetic on screen. I believe Fienne’s performance could be Oscar worthy, yup I said it. If you enjoy Anderson’s movies, then you should definitely go out and see it if you still can. Finally, this is the type of movie that I wish I had a slice of strawberry cake with a glass of wine to enjoy it with; this would pair well with the deliciousness of this movie. Enjoy! I’ve gotta take the plunge with Anderson one day, but not sure this is the film to start with. Regardless, great review! Great review! I love Ralph Fiennes – from the time I watched the English Patient and ever since. He is just such a cool guy! Fun fact – he is related to Sir Ranulph Fiennes, one of the greatest explorers EVAR. I obviously need to watch this 🙂 Good review! Yes he is awesome! You should totally see it if you can, I think you would like it. Excellent review. I was absolutely in love with this film. Thank you I loved it, I can’t wait to rewatch it! Thanks appreciate it! The whole time I was watching it I thought it was like a silent movie or one of those old school ones. I meant in comparison to the way Hitchock fetishizes women, Anderson does the same to an extent with his own themes and what not. Make sense? Awesome glad you agreed! If anything a Golden Globe nod. Just when you thought Anderson couldn’t top his previous work he comes up with possibly his best ever. Great review! Thank you! Yes it was a great movie! Good review Melissa. A very fun and frothy movie that anybody expects to see from Anderson. Thank you! Yes that is a good way to describe it fun and frothy. oh yeah! Great review Melissa. Of what is, definitely, a great film. For the colors, acting and whatever else. Agreed Fiennes could be Oscar-worthy, though I would be surprised if he gets a nomination – Anderson’s actors usually don’t. And there is probably some hope. Fiennes is a two time Oscar nominee and one of the most praised actors to have never won one. Maybe the academy will finally decide to change that. Agreed! 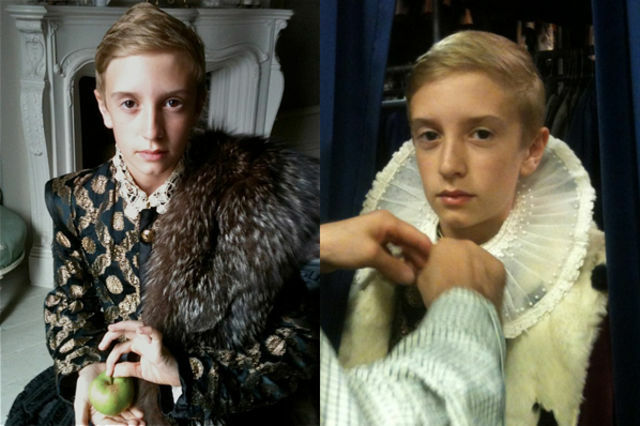 Hey there is hope then, maybe even a Golden Globe nod would be awesome for him. Something because this movie is just too cool to go unnoticed.